2014 update! You can now buy prints of this map! The planet Gliese 581g – also known as Zarmina – is a circular world. Zarmina, from above the substellar point. For discussion of Zarmina, some reference points and directions are necessary. 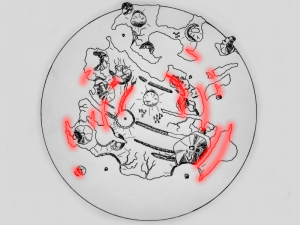 The circular boundary of the map is the ice line: beyond this point, water is certain to freeze. The center of the circle thus defined is the substellar point. When standing here, the red dwarf Gliese 581 is directly overhead. This image shows Zarmina oriented with is orbital plane horizontal. 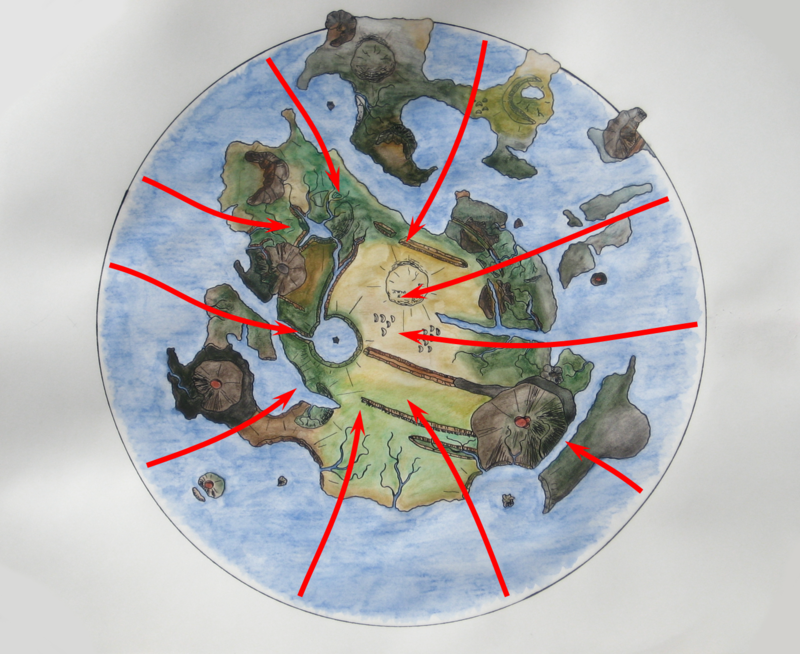 The planet has a south magnetic pole pointing roughly towards the top of the page, and so the “top” and “bottom” of this map become the cardinal directions north and south. East and west take on their usual definitions. This variation in tidal force results in one of Zarmina’s most striking surface feature types. In areas predominantly located to the west and east of the substellar point, the crust can stretch and crack open into concentric ring-like shapes4 – like parentheses around the center of the disc. Blocks of rock surrounded by these faults drop downward slightly into arc-shaped rift called graben. These graben are the primary tectonic features on the planet. An explanation for these features involves true polar wander. Due to gravitational tides, volcanos, or other forces, the mass distribution of the planet’s crust changed enough that the entire world shifted. Its spin axis flipped around, over a geologically short period of time. 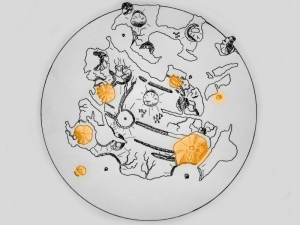 Zarmina is predisposed to have land in the center of its disc, and ocean towards the edge – so the land mass to the north of the disc must be the ancient substellar point. This point in time serves as a convenient marker for Zarminan geologic history: we divide events on the planet into the “first epoch” and “second epoch” according to whether they happened before or after the polar wander. The arc-shaped graben are surrounded by faults – weak points in the planetary crust. Though Zarmina shows no evidence of plate tectonics, it does have a liquid core and mantle. (The liquid core is the source of Zarmina’s magnetic dynamo.) Magma from the mantle can ooze its way to the surface wherever a “hot spot” coincides with a weak point in the crust, eventually building up a shield volcano or spatter cone and extruding lava flows.5 In the absence of tectonic plate collisions, volcanism is the only major mountain-building process on Zarmina. A few active volcanoes are even gradually building Hawai’ian-style islands in the ocean. Unlike on Earth, many well-preserved impact craters are visible on Zarmina. Earth’s plate tectonics warp and change surface features fast enough to eliminate craters quickly. But on Zarmina, without plate tectonics, craters last a long time.6 Surface erosion from water and wind eventually smooths out the craters, though, especially the older ones from the first epoch. In addition, the thick atmosphere prevents bolides (meteors) below a critical size from reaching the surface, so impact craters on Zarmina are all larger than a certain minimum diameter. 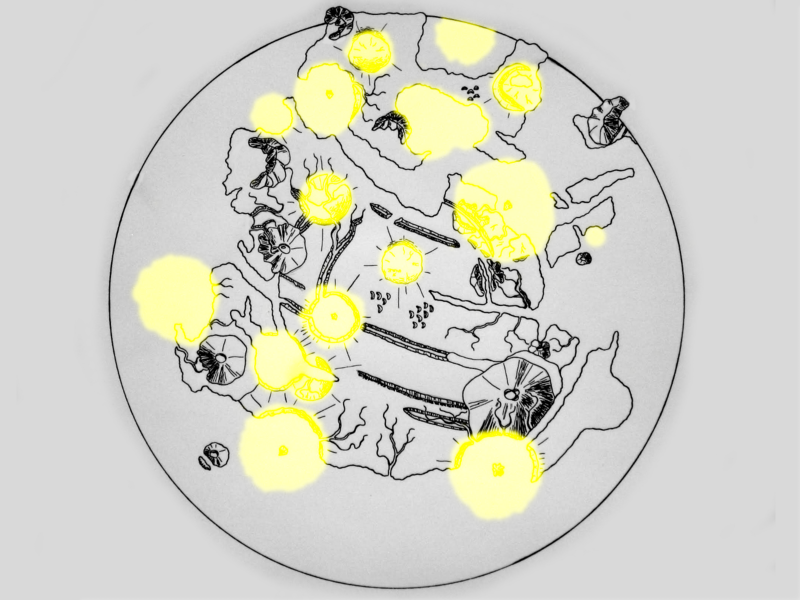 Some of the most dramatic examples of craters are near the substellar point. In the desert close to the center point of the disc is a first-epoch impact site, degraded by erosion. Nearby, a set of barchan dunes of sand demonstrates that wind-driven erosion is still happening. To the southwest, a more recent crater has a well-defined circular edge and a central peak (though it is mostly filled with seawater at present, since several graben pierced the raised crater rim and opened a channel to the ocean). The older, northern terrain – the ancient substellar point – is more heavily cratered than the remaining surface. Approximately 12 of the easily apparent craters date from the first epoch. 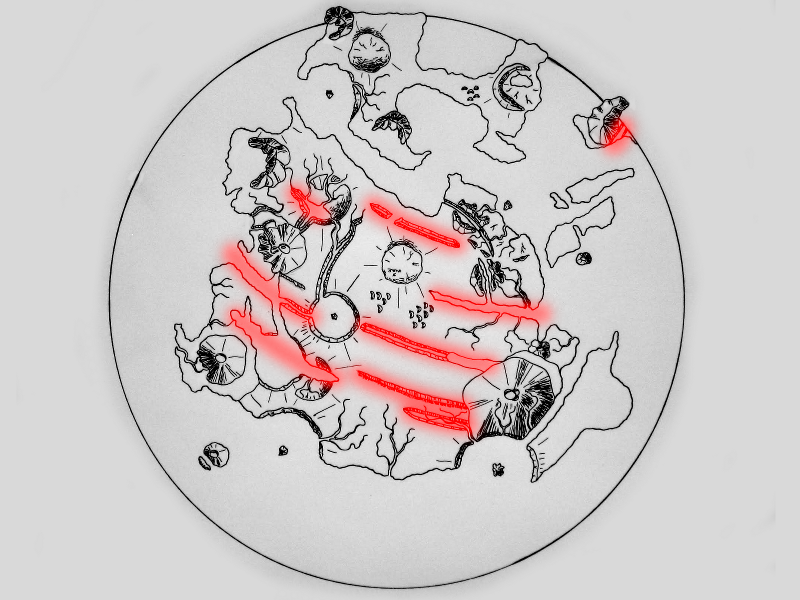 The remaining six obvious craters in the map above occurred after the episode of polar wander.7 They also happen to be near the equator, since the planetary equator is closely aligned with the orbital plane of the entire star system – where asteroids are more likely to be. This island is composed of a basaltic lava flow from the active shield volcano to its west. (There is some variation in composition where the impact to the southwest threw up an ejecta blanket.) The unusually regular shape of this island comes from two older features: a graben, which stopped the flow from moving southeast and instead diverted it to the north and southwest; and an impact crater which filled with lava. The entire island is an example of inverted topography, composed of erosion-resistant basalt filling in the gaps left by the older landforms. 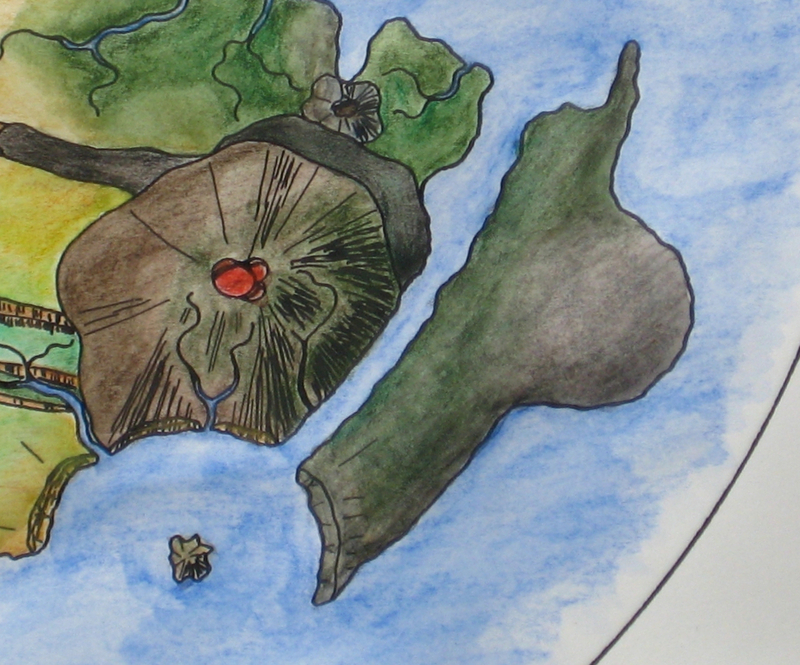 When the lava originally flowed out from the volcano, it would have formed a peninsula connected to the main continent – a later graben (and a later crater) created the long, curving strait. Other areas of the planet also contain lava flows spilling into graben, or regions where the flows interact with canyons and other features. In the northeast of the central continent, tectonic forces formed a graben directly through an extinct volcano. This volcano shows a great deal of other evidence of erosion, including rainwater channels cutting into the rock face and sculpted shapes from the high winds coming off the ocean. (In fact, this tropical region of the planet contains a large number of fanciful jungle hoodoos due to a soft rock composition and the sea winds.) This is not the only place on Zarmina where the interior of an old volcano is exposed, revealing orange-red sculpted rock in the welded volcanic neck. In general, the climate of Zarmina is warm at the substellar point and cold at the ice line. Moving from the center of the disc to the edge, you would encounter desert, tropical jungles, temperate regions, taiga, and finally tundra. At the ice line, rocky land and ocean both disappear under a cap of water ice and conditions rapidly become inhospitable. 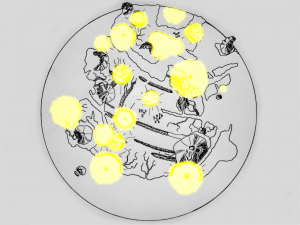 Vegetation appears on Zarmina’s landmasses wherever the local climate conditions allow: most of the wind-stripped coastline is sparsely covered, but lush areas are located further inland where the wind speed is not as high and there is more fresh water from rainfall. Plant life concentrates in regions near lava flows and crater ejecta, where the surface rock has been churned up into soil. Most mountains have a rain shadow on their inland (lee) side. The southern coastal regions are rich plains; the northeastern islands are low, windswept barrens; the northern continent disappears into snow and ice. The most verdant areas are those where the general circulation pattern brings rain over the land, but local topography tempers the wind speeds. This is a world that, to those of us familiar with Earth, is truly alien. The very structure of the world predisposes us to think of it as a flat disc with a finite edge, and the processes shaping the surface of Zarmina create bizarre and unfamiliar landforms. Yet, regions of Zarmina echo the settings we find on Earth. The cultures that have evolved on this planet are surely just as alien…and just as eerily familiar. We will have to wait for the next round of interstellar probes to find out. I had a tremendous amount of fun developing this map. My usual process is more imaginative and artistic than scientific, though I do occasionally consider such phenomena as rain shadows and fault lines. 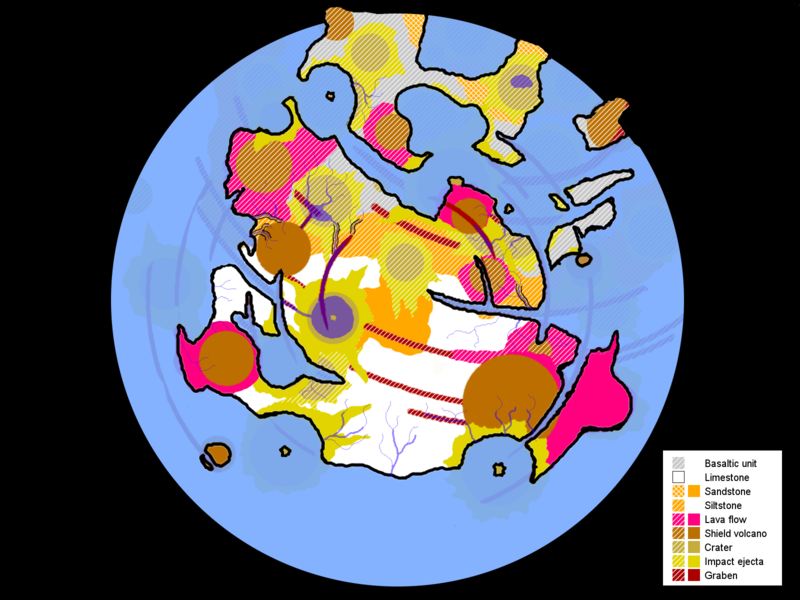 This time, I came up with the basic structure of the world (land in the middle, sea at the edge) and a list of a couple geologic processes: graben formation, impact cratering, volcanism, erosion, and polar wander. Then I went through a couple iterations of applying them in sequence. 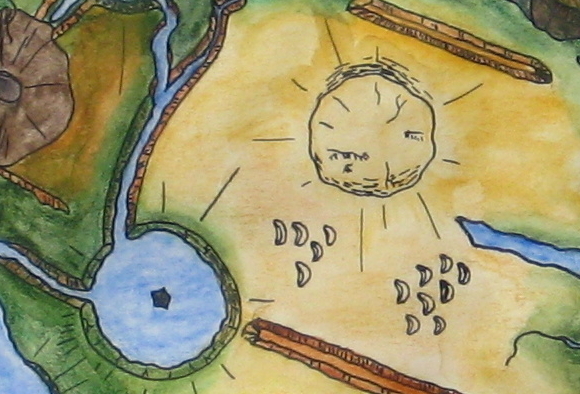 That geologic map you saw above was actually my starting point – I threw craters and volcanoes on there, rotated the whole thing for polar wander, and repeated. The basic compositional units changed as I did this to reflect the history I was building up: siltstone where the land had been just offshore, limestone where it had been in deep water, and so on, and then I would imagine some of those rocks eroding more than others. The tough thing was deciding where to limit this process: it’s good that I only picked a couple basic mechanisms, instead of trying to account for, well, everything! The really awesome thing, from an artistic point of view, is that this process took a lot of the control out of my hands. I was watching the world develop, and I had only very general things to say about how that happened. It became harder and harder to decide, “I want a mountain there and a canyon there!” Another effect I observed was that sometimes I ended up with really cool-looking landforms…and then as soon as I applied my next set of geologic processes, I’d see those locations obliterated. Of course, equally interesting features would pop up somewhere else on the planet. 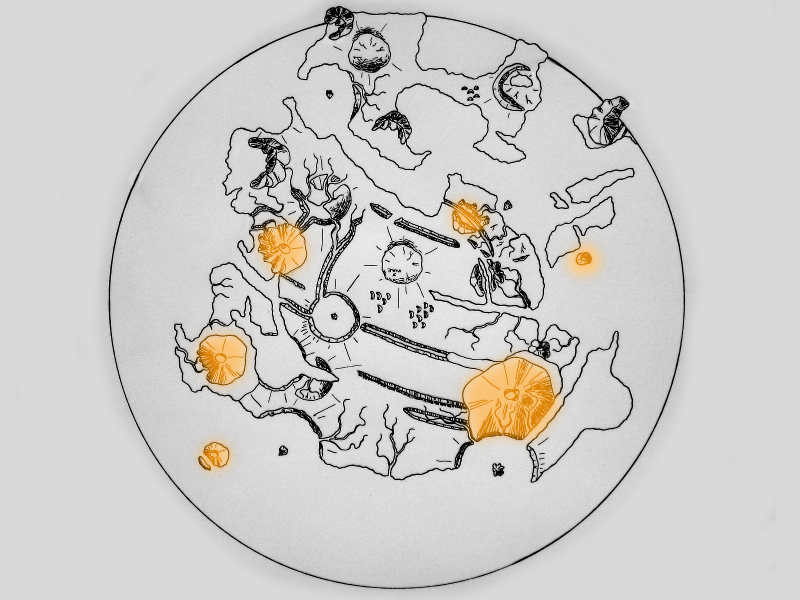 I will have to do some more maps this way, and see how they come out. And do you know what I need? 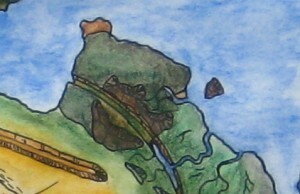 I need a better way to digitize these maps. This thing looks way better in person. 1 This is the “eyeball Earth” scenario, first described by Dr. Raymond Pierrehumbert. 2 Let’s get on this. 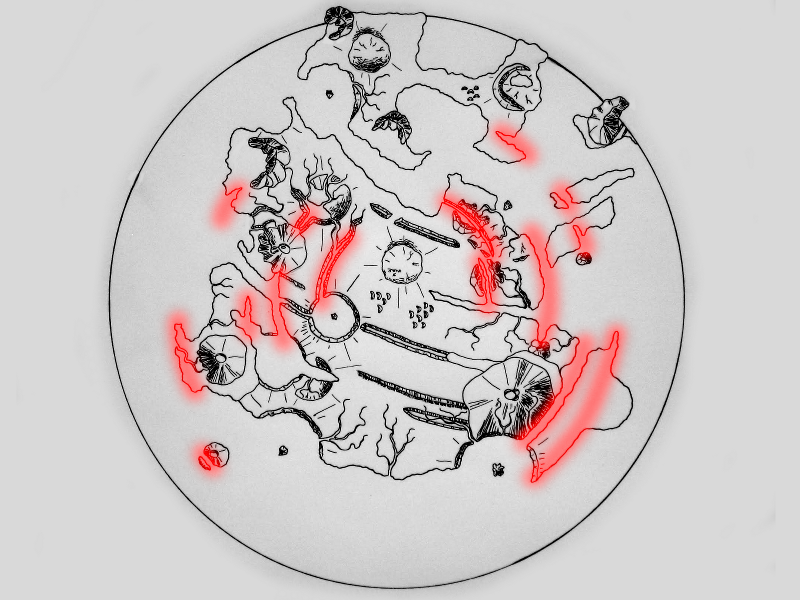 3 In fact, this is the decision about my map design about which I have the least confidence. But it’s a very basic decision. I just decided to go with it. The map is cool, dangit. 4 At least, according to my rough models, that’s where these features should concentrate and that’s how they should be shaped. In real life, this happens in rift valleys on Earth, but due to plate tectonics. Tides cause similar effects on worlds like Europa and Ganymede. 5 I decided that these hot spots have a sufficiently hard time getting through the crust that they’re more likely to sit at a weak point for a long time. So, we almost always get the shield volcano to go with the flow. 6 If anything, I didn’t put enough craters on the map. I probably should have placed more on the more ancient first-epoch terrain to the north. Let’s just say the ice is covering up a lot of craters! 7 There are more under the ocean. That’s how we ended up with first-epoch craters in the more southerly terrain. 8 I’ll freely admit that I’m more geologist than climatologist. And I’m definitely more physicist than geologist, and more engineer than physicist, so climate modeling gets a pretty low level of expertise from me. I think this all sounds plausible, anyway! This entry was posted in Art, Concepts, Geology, Maps, Original fiction, Science Fiction, Space. Bookmark the permalink. I have fun making maps too, but this brings a new literal meaning to the term ‘worldbuilding’ for me. Wow. You put a lot of thought into this. I need to read up on some more geologic phenomena to fill out my arsenal. Love this. Your maps are really cool. Especially this approach, which I’ve tried but was limited by my lack of general geology knowledge. This is my favorite map to date, for a number of reasons! If you want to try this approach out, I strongly recommend that you start by defining a very limited set of geologic processes to use. If you try to model everything, the problem will quickly get out of hand!